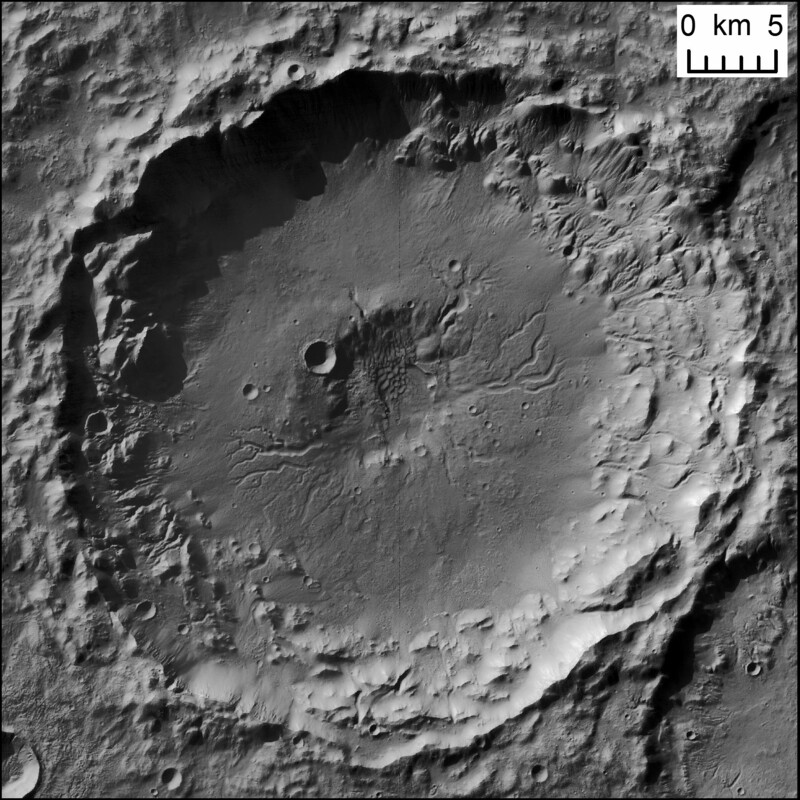 Image 2 shows the range in valley morphologies found in craters. The valleys have a variety of forms, from sinuous to linear, and exhibit a range in both width and depth of incision. Additionally, some of the valleys have extensive tributaries while others have a limited number of tributaries. This range in morphologies may be due to different water sources, the presence or absence of faults, water availability and/or the degree of feature preservation. Many of the observed valleys terminate at the apices of fan-shaped features whose toes are located on the wall or floor of the central pit (Image 2). These features have been identified as sedimentary in nature and may be preserved deltas. If this is the case, then the central pits hosting these fans must have once held standing water. Image 2: Portions of Mars Reconnaissance Orbiter Context Camera (MRO CTX) images showing differences in valley morphologies. (a) Sinuous and more dendritic valley networks leading to a pit in the lower left of the image (B19_016981_1432_XN_36S201W). (b) Example of a more rectilinear valley network leading to a central pit in the upper right of the image (B21_017751_1609_XN_19S347W). North is up in both (a) and (b). Some central pit craters with interior valley networks have sedimentary features located closer to their source areas. The crater in image 1 contains numerous examples of this. Some of these pit valleys are partially covered by sedimentary features identified as alluvial fans, while other valleys appear to cut through alluvial fans within the same crater. These relationships suggest that the availability of water was variable. Derived discharge estimates (based on a channel-to-valley ratio of 0.14 (Penido et al., 2013) for valleys within five sample craters were found to range between 10 and 104 m3/s. The source(s) of the water is currently under investigation, but results to date suggest that precipitation was likely a significant contributor. Alzate, N., Barlow, N. G. (2011), Central pit craters on Ganymede, Icarus, 211, 1274-1283. Barlow, N. (2010), Central pit craters: Observations from Mars and Ganymede and implications for formation models, Geological Society of America Special Paper, 465, 15-27, doi:10.1130/2010.2465(02). Bray, V. J., Schenk, P. M., Melosh, H. J., Morgan, J. V., Collins, G. S. 2012, Ganymede crater dimensions – Implications for central peak and central pit formation and development, Icarus, 217, 115-129, doi:10.1016/j.icarus.2011.10.004. Croft, S. K. (1981), On the origin of pit craters, Lunar and Planetary Science XII, P. 196-198. Abstract. Elder, C. M., Bray, V. J., Melosh, H. J. (2012), The theoretical plausibility of central pit crater formation via melt drainage, Icarus, 221, 831-843, doi:10.1016/j.icarus.2012.09.014. Peel, S. E., Fassett, C. I. (2013), Valleys in pit craters on Mars: Characteristics, distribution, and formation mechanisms, Icarus, 225, 272-282, doi:10.1016/j.icarus.2013.03.031. Penido, J. C., Fassett, C. I., Som, S. M. (2013), Scaling relationships and concavity of small valley networks on Mars, Planetary and Space Science, 75, 105-116, doi:10.1016/j.pss.2012.09.009.